Organic means looking after the land, animals and wildlife better. All organic farms have to have been chemical free for three years before they can be given an license, plus an array of other standards (crop rotation, packaging etc). We rented from a farm that was already organically certified, so we have gone straight into a full license, our farm license number is: AB27365. We also have to have a license for running our veg box scheme as well, and this license number is: AG27365. Our certificate for farming is here and for running the box scheme is here. We are inspected yearly, and the standards are laid down in European law. Non-organic food makes wide use of pesticides which can pollute water, the environment and make their way into the food chain. Government testing in 2015 found pesticide residues in 43% of British food, and many of these contain more than one pesticide. The herbicide glyphosate is banned, as the World Health Organisation identified it as a probable carcinogen. These pesticides affect other wildlife and the environment by direct poisoning too. As organic growers we rotate crops, use crop protection like nets, and work with nature to avoid disease problems without chemical inputs. We sell organically certified eggs from Abbey Leys Farm. The organic standards ensure that they are truly free range, and their living conditions, food quality and use of antibiotics is monitored. GM feed is not permitted. The Soil Association have written a blog page outlining why organic is a higher standard than free range here. Intensive farming practices have driven loss of natural habitats of bees and other pollinators. Harmful pesticides, especially neonicotinoid insecticides, have played a key role in the decline of honeybees and other pollinators. But on average, plant, insect and bird life is 50% more abundant on organic farms. And they are home to 30% more species on average. Research shows that organic crops are of a much higher nutritional quality than non-organic ones. 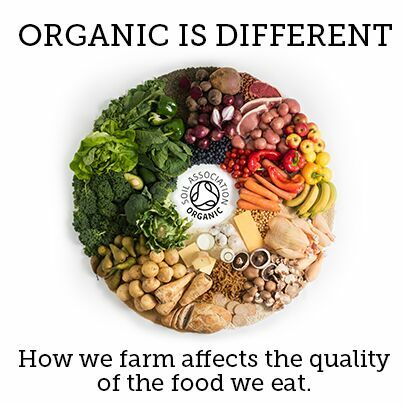 The peer reviewed research published in the British Journal of Nutrition found significant differences between organic and non-organic farming. Switching to organic veg can lead to increased intake of nutritionally desirable antioxidants, as well as reduced intake of potentially harmful cadmium and pesticides. More information on the research is published here. This is the comment we get most from our veg box and market stall customers, who cannot believe how much flavour there is. If you want your cooking to be next level, then you need ingredients that you can really taste. This is most pronounced in crops like: carrots, beetroot, tomatoes, fennel and apples. It is because the crops are harvested when they are fully mature, at the right time of year, rather than immature where they ripen in transit. Find out about our veg box scheme here.